We believe the only person who has rights is the person who knows what those legal rights are. We offer legal advice and representation in the areas of employment, divorce, mediation and criminal law. Based in North Andover, our law firm understands every case and every situation is unique. Our mission is to provide qualified, aggressive legal support to individuals in their time of need, as well as to educate them on their rights. At the Law Office of Stark & Heiner, we believe a strong attorney-client relationship is the first step towards achieving a favorable legal outcome, and a relationship built on trust is a strong backbone to any legal case. Whether you are going through a divorce or have an employment issue, we will guide you through the process step by step. Our firm was founded on a mission of actively protecting the rights of our clients. We believe the only person who has rights is the person who knows what those rights are. Our law office provides personalized service and a true understanding of what the law means to you and your particular situation. We offer legal guidance and representation in anything from wrongful termination and discrimination to retaliation and sexual harassment, with services geared towards employees and employers alike. From alimony and child support to restraining orders and visitation rights, we assist our clients in resolving a wide range of divorce law issues. Have you been charged with a crime such as DUI, assault and battery, or shoplifting? We offer criminal representation in a wide range of areas. The Law Office of Stark & Heiner is committed to achieving and maintaining excellence in all areas of our practice. We are proud to be recognized for our efforts with the following awards. The Law Office of Stark & Heiner was founded by Attorney Timothy F. Stark, who was admitted to the Massachusetts Bar and Federal Bar in 1991. With more than a quarter century of experience in employment and divorce law, along with a background in human resource management and psychology, Attorney Stark develops legal solutions driven by an intuitive and informed understanding of the law and client relations. 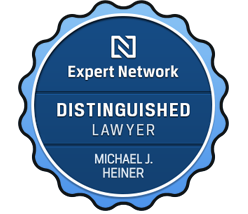 Attorney Michael J. Heiner joined the practice in 2011, and became partner in 2015. A graduate of the Massachusetts School of Law, Attorney Heiner started his career as a police officer before deciding to attend law school in 2009. Fluent in Portuguese, Attorney Heiner prides himself on working hard every day for his clients, with education of legal rights at the forefront of all interactions. The foundation of our service is built upon the aggressive, ethical practice of law.